For low carbers, artificial sweeteners often mean the difference between blowing your carb limit for the day, or safely satisfying a sweet craving. However, most powdered forms of fake sweeteners contain some sort of sugar based bulking agent, such as maltodextrin, or dextrose. This adds carbs to your daily total, so if you use a packet, count it as one carb. 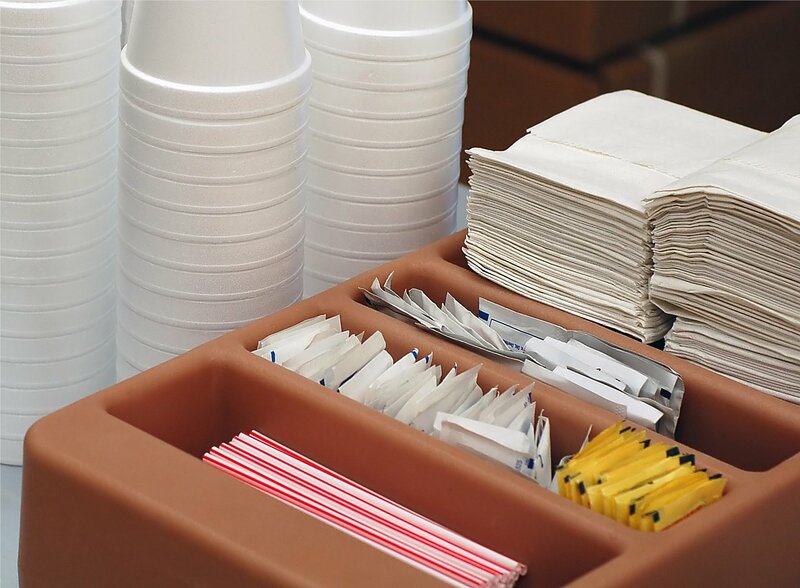 Liquid artificial sweeteners are becoming more popular, as no bulking agent is needed. I don't particularly like to use artificial anything, but I've come to the conclusion that for my health and wellbeing, a little fake sweetener is better than consuming real sugar, in relation to my insulin resistance. If the idea of a chemical sweetener doesn't sit well, you may want to look into the category of sugar alcohol sweeteners. These do have calories and carbs, though the amounts are much smaller, and there is much reduced effect on blood sugars because they are absorbed slowly. Below is a list of some artificial sweeteners that can be used on a low carb diet. Be aware there is a great deal of controversy around these products, so you'll have to decide for yourself whether you want to use them. I've put together a list of the "pros and cons" for each. I am referring to the powdered version unless otherwise stated . Acesulfame Potassium, or Acesulfame K, is marketed under the brand names of Sunett or SweetOne. It's commonly used in soft drinks and commercial low sugar products, many times in conjunction with aspartame. It's 180 times sweeter than sugar, has zero calories, and has no effect on tooth enamel. Pros: Acesulfame K is stable under heat, and in moderately acidic or basic conditions, and it can be used in baking, and acidic liquids. It is also used as a flavor enhancer in non-food products such as gum and soft antacids. Cons: Some studies with rats have shown that it causes an increase in insulin, just as sugar does. Aspartame is marketed under the brand names of Nutrasweet or Equal. It's probably the most well known of all the artificial sweeteners, and is commonly used in most soft drinks and commercial low sugar products. It's 200 times sweeter than sugar, has zero calories, and has no effect on tooth enamel. Pros: There's a body of research which says that aspartame is safe. It's also readily available, and is used in all kinds of commercial food products. Cons: Some experts contend that aspartame consumption is associated with headaches, dizziness, chest pain, nausea, weight gain, depression, memory loss and anxiety attacks. People with a condition knows as phenylketonuria (PKU) should not use aspartame, as it contains phenylalanine. In addition, aspartame is unstable at high temps, so it shouldn't be used in baked or cooked foods. The heat destroys the proteins from which aspartame is made. Saccharin is marketed under the brand names of Sweet n' Low. The sweetener has been around since the late 1800s. Saccharin is 300-500 times sweeter than sugar, has zero calories, and no effect on tooth enamel. In the past, saccharin was incorrectly identifed as a potential carcinogen, but this association was disproven, and it is now available on the open market. Pros: Saccharin, as with any artificial sweetener, has benefits as an alternative to sugar, and a flavor enhancer. It is commonly used in non-food products such as toothpaste and cold remedies to improve the flavor. Cons: It has a metallic aftertaste, and isn't suitable for baking or cooking. Stevia or stevia derivatives are marketed under the brand names of Pure Via, Truvia and SweetLeaf, among others. The sweetener is created from a plant native to South America. Stevia extract is 200-300 times sweeter than sugar, has zero calories, and no effect on tooth enamel. Pros: It's created from a plant, and as such, is a more natural product, and it contains many nutrients that help regulate blood sugar, including chromium, magnesium, manganese, potassium, selenium, zinc, and vitamin B3(Niacin). In several studies, stevia has been shown to help diabetics maintain blood sugar control. Cons: Some experts contend that there is not enough research which shows stevia is safe, although the sweetener is commonly used in many products in Japan and South America, and has been for many years with no reports of problems. The powdered form has a back taste of licorice, but in the liquid form, the back taste is almost eliminated. I don't use stevia because it gives me a raging headache in even tiny amounts. Sucralose* is marketed under the brand names of Splenda and Apriva, and is relatively new on the artificial sweeteners market. It was approved for use in the United States in 1998. It is created from changing the chemical structure of common table sugar. Sucralose is 600 times sweeter than sugar, and no effect on tooth enamel. Pros: The taste of Sucralose is very close to sugar. Although it does have some carbs (24 per cup) it's much less than sugar. Sucralose can be used for baking and cooking, as it maintains its sweetness at high temperatures. The liquid forms of sucralose are becoming popular as they are essentially carb free, but they are not as readily available, as the manufacturer of powdered Splenda has not come out with a liquid version. Other companies have stepped into the void, but these liquid artificial sweeteners are mostly available online only. Look for EZSweets, FiberFit and Sweetzfree. However, be aware these forms are extremely concentrated, and in some, a single drop is has the sweetening strength of 2 teaspoons of sugar. Cons: Less research has been done on the safety of sucralose. The research that has been done is split on safety issues. Some studies show that it effects the thymus gland, other's say it's safe. At least one study showed that consuming sucralose resulting in a rise in insulin secretion and clearance, which should be a concern for anyone with insulin resistance. Other studies talk about the effects on the gut microbiome. There are many anecdotal reports on the web which indicate it may be associated with headaches and memory problems. Green Med Info has a page on sucralose here. On a personal note, my younger sister used Splenda for years, but finally decided to stop. Within a few months of stopping, she lost 20 pounds without trying. Makes me wonder about the gut studies. A note on artificial sweeteners and Splenda in particular..
*Note: Some readers have objected to my recommending Splenda. If you have concerns about this, please note that I have done research in the medical literature and I have reviewed the studies on sucralose (Splenda). I have yet to find a gold standard, clinically controlled HUMAN study which provides conclusive evidence that sucralose causes injury to human health. There are many RAT studies, which I don't count. There is evidence that artificial sweeteners do have an effect on gut flora, and as I said above, Splenda has been shown to cause a rise in insulin in obese people. But bottom line for me is this: using artificial sweeteners is an individual decision, and you should go by how you feel. If any sweetener or other food product causes problems for you, avoid consuming it.